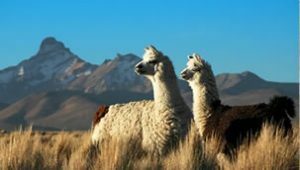 In nature llamas met their nutritional needs by roaming to find plants, licking on mineral deposits and other plant material and consuming fresh, clean water free choice. Farmers now confine their livestock to dry lot paddocks or pastures. Our product choices support feeding llamas either free choice or scheduled feedings. Many people believe that animals know what their bodies need and when they need it. In nature they would find it. Llamas certainly can’t roam far to meet their nutritional needs. We offer products that support free choice feeding for your herd. SweetPro’s Fresh Start with Diatomaceous Earth is great if you prefer to feed your llamas in a TMR format we suggest feeding. Fresh Start is an all-natural, non-molasses, non-starch loose supplement that is intended for hand feeding. Fresh Start contains all the protein, vitamins, minerals, yeast, live enzymes, pre-biotics and diatomaceous earth for nutritional needs. Fresh Start can be ordered in 50lb bags or 2,000 lb totes. Please note that Fresh Start is suitable for all ages of cattle. Fresh Start is fed at 1 oz. /100lbs of body weight per day.